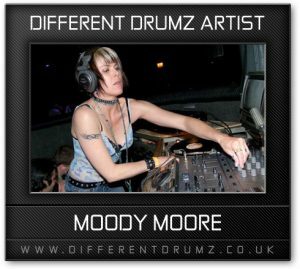 Moody Moore has been a firm part of the Different Drumz family for over 2 years now with her monthly ‘Attitude Adjustment Show’. On the show, she highlights the DJ’s, MC’s and producers in the DC, VA and MD area. She’s also a regular on the DnB local circuit. A bona-fide drum n’ bass veteran, Moody Moore is a well-known fixture in the electronic dance music scene in the DC metro area. Hailing from Colorado, Moody humbly began her life as a DJ over 15 years ago. Within the first year of her career, her talents have graced the decks at illustrious east coast clubs like Nation and Sonar, and eventually migrated to current DC venues like U Street Music Hall, and Flash. She’s opened club nights alongside The Crystal Method, DJ Rap, Pendulum, Donald Glaude, and many more. She’s also a regular on the summer festival circuit and has played events like Burning Man in Nevada, and Starscape in Baltimore. Moody’s own range of musical prowess grew rapidly during this time, and for a short period during the mid-2000s, she also took up residence on the West Coast and threw events in Los Angeles, and San Diego, CA. Her experience with 8:39 Productions in promoting Electric Shock was invaluable in giving her a greater sense of perspective/ownership over realizing, creating, and maintaining the most important value in any party: the vibe. In the 2000s, having formed the first all-female drum n’ bass crew in DC, The Bansheez, Moody’s talents were regularly on display at Alchemy / A.L.I.A.S. at Nation almost every week, if not more. She won multiple DJ contests over the years at Nation, establishing herself quickly as a serious fixture in DC drum n’ bass. Alongside DJs Inna K, Skandalus, Sylkey, and Jungle Jessi – the collective smashed crowds at raves, clubs, house parties, and much more during the last decade. Most of the Bansheez still DJ regularly to this day, and are known fixtures in the scene as some of the most dynamic and energetic females representing drum n’ bass, dubstep, electro, and more. Today: armed w/ years of experience; gigs up and down the east and west coast, and festivals under her belt that have bestowed a level of understanding behind the mechanics of dance music, Moody is proud to announce the release of her own website: MoodyMoore.com. The site’s mobile-friendly, and showcases the latest gigs/mixes/thoughts/images from Moody’s DJing exploits around the world. Stay tuned: even more amazing events, collaborations, gigs, and more are to come. For Moody Moore: the best she has to share with you has just begun. Moody Moore presents The Attitude Adjustment Show live on Different Drumz Radio on the first Saturday of every month from 7-9PM(GMT) playing the best in fresh drum and bass and also features a wide range of well known guest artists, make sure to check here out!